Saturday night was Boston Symphony opening night. While it was also technically the first opening night of Music Director Designate Andris Nelsons’ tenure, his appointment came too late to have any impact on this season. We will need to wait a year for the inauguration of the new era; instead, we had opening night comfort food—an all-Brahms concert, with the reliable Christoph von Dohnányi at the podium. Dohnányi led the orchestra in several major Brahms works last season: the Variations on a Theme of Haydn at Symphony Hall, and the Second and Fourth Symphonies at Tanglewood. The Second Symphony was on the program on this evening, coupled with the Double Concerto. This is the sort of program that one expects from a major symphony orchestra: music of great reputation, performed with élan. Pick your cliché—this concert is the “bread and butter” of a major symphony orchestra, music that is “in its wheelhouse,” its “stock in trade.” If there were no surprises, welcome or otherwise, there was familiarity and a sense of satisfaction at a job well done. It played to a nearly full house, and provoked warm standing ovations. The Double Concerto is almost a curiosity, a late-Brahms orchestral piece that is infrequently played. Brahms aged early; the Double Concerto, written 1887 when he was 54, is his last orchestral work. In 1888 Hermine Spies, an old friend, encountered Brahms by chance on a train and was upset at his aged appearance. There is a photograph of Brahms from 1894, when he was just 61, where he looks elderly and haggard next to a spry Johann Strauss, Jr., who was 69 at the time (to be fair, Strauss looks spectacular, he could reasonably pass for his early 30s). Given this, it is hard not to see some sign of falling-off in the Double Concerto. At its best, it is echt-Brahms: he is firmly in control of his musical surface, the themes catch the ear and prod at the emotions, the harmonies and texture unmistakably his own. But it threatens to turn into a Pyrrhic victory of craftsmanship, the triumph of facility over originality, and an air of fatigue hangs about it. * The presence of two soloists does not provoke Brahms to write much interesting conversation; after the dramatic opening, where each instrument gets a moment of soliloquy, much of the writing has the instruments either in rhythmic unison or in straightforward imitation. The first movement is long, the length of the two remaining movements combined, with stretches of development that provide display passagework for the soloists but that does not advance much musical argument. The second is a lyrical slow movement whose main theme is surprisingly predictable and symmetrical, with several internal repetitions that extend it without deepening it. The third, a gypsy-ish rondo, manages to gather up some energy, but relies mostly on pulse and volume to bring the work to its close. As such, presenting the Double Concerto makes an offering of a luxury item—a work whose surface appeals, but which requires the resources (two soloists, a large orchestra) only a major organization can marshal. The performance itself was satisfying—Dohnányi knows his way around Brahms, and the features of his conducting that I discuss with respect to the Second Symphony below were fully on display in the concerto. The solo parts were taken by Augustin Hadelich on violin and Alban Gerhardt on cello. 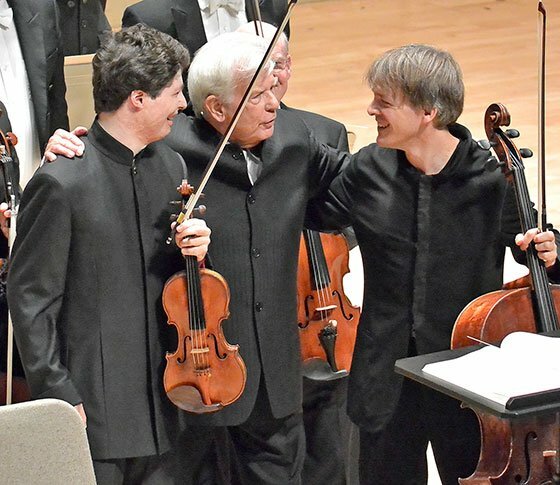 Hadelich was making his first appearance with the BSO at Symphony Hall—he played the Barber Concerto with the orchestra at Tanglewood in 2012—and brought a light touch and dancing energy to the performance. Gerhardt’s presence was more dramatic and stormy—his opening statement in the first movement was arresting. However, from my seat in the balcony near the stage, he became all but inaudible when the density of the orchestration increased. The musicians and orchestra effectively burnished the more ravishing parts of the musical surface, and delivered a work of good taste and polished technique. One might wish to hear both of them in an environment that shows them off more effectively. In particular, Alban Gerhardt’s biography states that he wants to “help audiences break with old listening and concert habits,” something he was certainly not able to do on this occasion. The Second Symphony has the reputation of being an unbuttoned, relaxed work, lacking both the painful, decades-long origin story that surrounds the first, as well as the first’s dramatic and monumental qualities. I have always found it unsettling: a summer’s day on the coast with unpredictable weather in which glorious sun gives way to threatening darkness and back again. Dohnányi and the BSO gave a performance that was deeply attentive to these changes of mood and feeling. In both pieces the orchestra produced a sound that was both firm and silky, weighty but transparent, a sensuous sound that kept its wits about it. The violins were split, and the basses, cellos and violas were placed from left to right. While I didn’t hear any particularly striking antiphonal effects from this arrangement, perhaps it contributed to this sound, both muscular and lithe. The interpretation paid back close attention. Dohnányi refused to italicize any particular flourish, but listening closely you heard distinctive anger in the dissonant clashes in the first movement, aching rubato in the diverging lines of the second movement. In the loudest sections, the sound was a glass wall, clear but solid; phrases had constant subtle rubato, whether played by individual soloists or by the orchestra en masse. Dohnányi conducted the symphony from memory, allowing him to roam a bit on the podium, showing gestures somehow both expressive and a bit awkward and boxy. Occasionally he displayed something grander, such as a sudden miming of vigorous cello bowing which brought smiles from the players. The trombones have an important role to play in the symphony. In the first movement they bring a sudden pall to the opening of the exposition, then they rip and tear at the music in the development. At the end of the symphony, Dohnányi barely looked at them. During one major trombone entrance, he was instead attending very closely to the second violins. Then, at the very end, he turned directly to them and they suddenly let loose as though they had finally been given permission, bringing the evening to a blazing end. The opening night audience was quirky; the first movement of the Double Concerto provoked a smattering of embarrassed applause, followed by quite a bit of embarrassed laughter. So many people were scrambling into the hall at the last minute after intermission that Dohnányi, who had already entered, turned from the podium and gestured that everyone should please take their time. After the first movement of the symphony, a storm of coughing broke out quite unlike anything I have quite heard, a positive explosion of hacking and throat-clearing. Perhaps the opening night reception, with its free glass of wine, had something to do with it. *Footnote: I don’t mean to suggest Brahms was tapped out at this point. He still had some new works ahead of him which shook off the Double Concerto’s sense of fatigue: the Third Violin Sonata, the Clarinet Quintet, the late piano music. This summer I had the opportunity to hear two movements of Brahms’ last work, the 11 Chorale Preludes for organ (Opus post. 122) from 1896, played by Mark DeVoto in a small church in Perry, Maine. These show two very different directions Brahms might have taken had he not been claimed by liver cancer in 1897. The first was an example of austere counterpoint which could be mistaken for Bach if you weren’t listening closely. But the second, a set of variations on “Lo, How a Rose E’er Blooming,” was odd and fascinating, suggesting a much more intriguing and perhaps productive future path. I had forgotten that Dohnanyi splits the violins – that always adds so much to a concert. Looking forward to more of your concert reviews. Why be embarrassed? Nothing wrong with it. Too much solemnity, already. A real H.I.P. would have plenty of unembarrassed clapping. Toscanini’s 1948 telecast of the Brahms Double shows the NBC studio audience applauding after the first movement, too. AT stands there, in concentration, as if he knew this would happen. Not such a big deal. H.I.P. be darned! They should be embarrassed, uninformed clapping can squash a magical moment! My rush seat tonight was Orch first row center. I think that Mr. Schuth was spot on with his review. A couple of thoughts as well: sitting in the first row after the long summer hiatus from live music it was heavenly to just get lost in the sound of the orchestra during the performances. Closing my eyes a couple of times I felt as though I were right in the middle of the music – just wonderful. It was also wonderful to hear the burnished, beautiful sound of the concertmaster’s playing after his long absence. Welcome back, Malcolm! With all this talk of so-called historically-informed performance, it will interest you to know that the cellist at the first performance of the Brahms naturally played on gut strings, but also without an endpin.